Climate Change Recovery – Children, Teens, Families, and Friends Doing All They Can—Which is a Lot! This site highlights the work of the youth, families and volunteers of YAE! (Youth Acting for Our Earth) and Plant-for-the-Planet Youth Ambassadors for Climate Justice and their families and friends across the U.S. and beyond. It has grown out of the work of one family (Pam, Rob, Miko, and Isaac Vergun) and their friends and acquaintances on the Climate Crisis. Together we collaborate with nonprofits like Our Children’s Trust, the Sierra Club, Plant-for-the-Planet, 350.org, and Climate Change for Families. 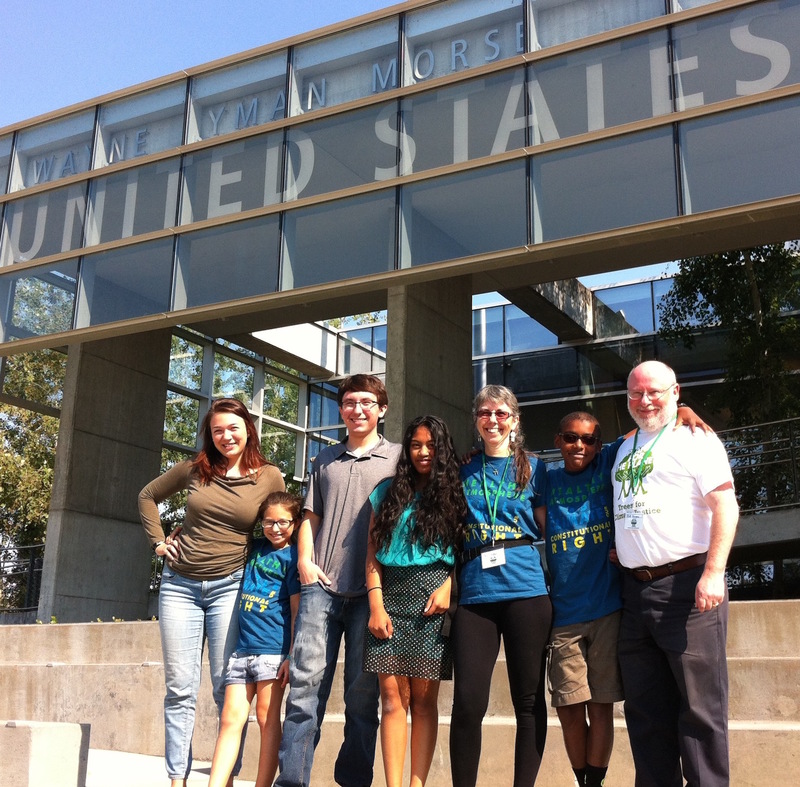 The Vergun family (Miko, Pam, Isaac, and Robert Vergun) with Kelsey Juliana, Hazel Van Ummersen, and Alex Loznak after filing the Federal Petition in Eugene for Kelsey Juliana et al. v. U.S. Join us in insisting that the youth be heard and that the trial be scheduled immediately—and recorded, live-streamed, and archived for Americans and others to be able to see. Learn more at: Our Children’s Trust. Youth Acting for our Earth—YAE! Join us for one of our upcoming youth climate trainings, or invite us to your area! Details below. Note: If you are a teen who can come without your parents, that’s great, but please consider encouraging them to come anyway, so that they can even better support your activism! Cool Islam and Bilal Mosque are again our hosts for this training for families of all backgrounds. First Congregational United Church of Christ and the Tikkun Olam Committee of Congregation P’nai Or Jewish Renewal are co-sponsoring this training. This Youth Climate Training will be led by Dylan Beckett, Plant-for-the-Planet Global Board Member, and a team of Youth Climate Leaders, with support from Pam Vergun. Parent Leader Bill Rensmith will be leading the parents’ meeting. Students who have already done this training or a Plant-for-the-Planet one, want to apply to help lead it? Contact Pam. Youth Climate Trainings are free and open to all students in grades 4-12th. Younger students may be able to join with prior permission and special arrangement. 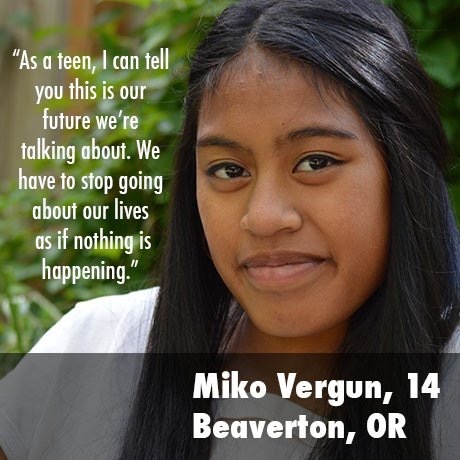 To register for this Youth Climate Training, please click here: Student Registration – April 13, 2019 – Beaverton, Oregon. If you would like to register as an adult volunteer or as a Youth Leader to lead this Training, please click here: Volunteer Registration – April 13, 2019 – Beaverton, Oregon..
For now, Facebook is your best bet for the most recent updates, though! Climate Change Recovery works with key environmental nonprofits and is working to bring Youth Acting for Our Earth (YAE) to more areas in order to support youth training other youth in Climate Science and Climate Justice! Please contact Pam at vergun@ alumni.stanford.edu if you would like to support a training in your city or state. Climate Change Recovery and Youth Acting for our Earth (YAE!) recognize the importance and value of all people; we were founded based on a deep understanding of this and so have a policy against discrimination or harassment based on ethnicity (race), skin color, country of origin or citizenship, gender, gender identity or sexual orientation, religion, family status, marital status, mental or physical ability, or age in everything we do. We arrange for our youth and parents to be invited as speakers and facilitators for organizations around the U.S.
To see a sample of a recent talk by Miko and Isaac Vergun at the Living Future Conference, “Fifteen Minutes of Brilliance” before Keynote Speaker Terry Tempest Williams, pull up a chair and enjoy! 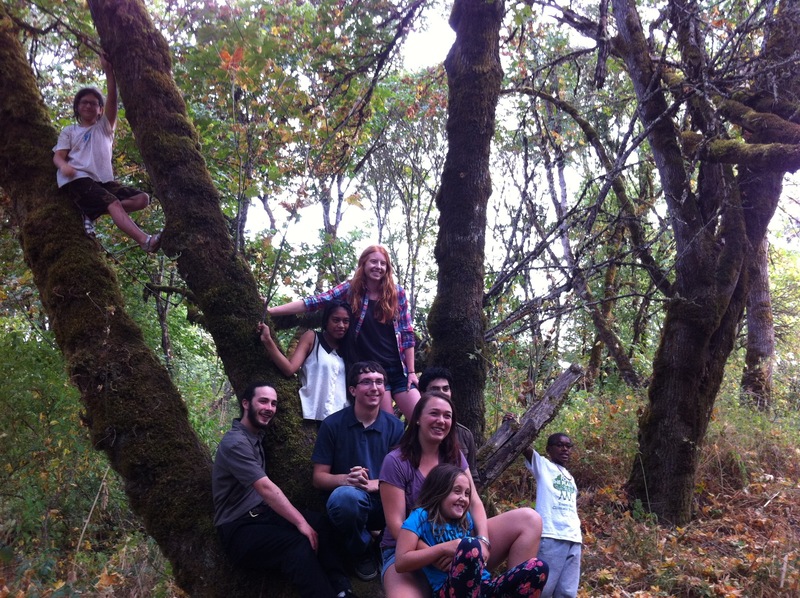 Plant-for-the-Planet U.S. is the recipient of an Oregon Jewish Community Youth Foundation (OJCYF) Grant for our work with American youth. OJCYF is helping us to strengthen our ability to work with more communities to act to try to stop the Climate Crisis. To donate to the work of Plant-for-the-Planet U.S., you can set up a tax-deductible, 501c3 donation to Plant-for-the-Planet U.S. that will enable us to help youth train other youth about the Climate Crisis. Go here to use our easy donation button where you can choose to support our program of youth training other youth by moving the slider to the left, or donate trees by moving it to the right, or anything in between, so Donate Now. Thank you! This is also the informal site for Plant-for-the-Planet U.S., the U.S. delegation of the United Nations sponsored nonprofit Plant-for-the-Planet. To inspire and help carry out policies to minimize the climate crisis and create climate justice—so that the crisis does not so severely impact some over others. Plant-for-the-Planet—sponsored by the United Nations Environmental Program—organizes free one-day trainings by youth for all youth in grades 4-12 to develop their ability to work for Climate Justice. Students learn about the science and social effects of Climate Change, learn to plant trees, and develop their public speaking skills in order to work with elected officials and others to try to stop and recover from Climate Change. After their training, youth and families gather together in clubs and engage in a variety of efforts together. Want to learn more about Plant-for-the-Planet? Invite her to speak at your organization! Interviewed for an in-depth piece on KBOO Community Radio about her presentations at the International School of Beaverton and the Jewish Renewal congregation P’nai Or of Portland, Miko is working to raise awareness about the U.S. nuclear testing—and continued military presence—in the Marshall Islands, as well as the impact of the mostly-U.S.-induced Climate Change in the Republic of the Marshall Islands and elsewhere. For more information, check out the flyer from her April 1, 2017 presentation sponsored by P’nai Or. As she described in her interview, Miko is a Climate Justice Ambassador with Plant-for-the-Planet who this year was elected as the Global Youth Board Representative for North America and Oceania. She participated in the Plant-for-the-Planet Youth Summit in October-November 2016 in Augsburg, Germany. Miko is also a Teen Board Member of the Oregon Jewish Community Youth Foundation (OJCYF) and was honored by the Oregon Marshallese Community (OMC), REACH-MI (Radiation Exposure Awareness Crusaders for Humanity—Marshall Islands), and MEI (the Marshallese Education Institute) for contributing to the Marshallese community at the 2016 Nuclear Legacy Summit. She is one of the 21 Climate Kids–a plaintiff in the federal Climate Change lawsuit Juliana vs. U.S. through the help of Our Children’s Trust. Contact vergun@alumni.stanford.edu to schedule a presentation. Our work appeared in the magazine Oregon Jewish Life in an article highlighting Isaac’s Bar Mitzvah Project! Do check it out: Bar Mitzvah Pursues Climate Recovery. What is a Bar or Bat or B’nei Mitzvah and why is this on a site about Climate Change? More on this later, but briefly, the phrases are ways of referring to “Children of the Commandments”, and in Jewish tradition, when a child takes on many of the responsibilities of an adult at about age 13, they are expected to do “Mitzvah”, which are “commandments”, sometimes called “good deeds”. This site grew out of our family’s work as Miko and Isaac started working on their B’nei Mitzvah Projects to help protect our planet with the help of their Mom, Pam, and their Dad, Robert Vergun. We will be getting more up on this site soon on how we have been working in Oregon and neighboring areas to help stop Climate Change, but in the meantime you’ll find most of what you need at the following two sites. So, what are the four coolest—and likely most effective—nonprofits working on Climate Change and Recovery? Thanks to volunteering with 350.org and 350PDX, luck, and two friends, we are delighted on October 12, 2015, Indigenous Peoples’ Day, to be joining many others in Portland in welcoming Naomi Klein and Avi Lewis to the first Portland screening of This Changes Everything at the Hollywood Theater! Thank you, Harriet Cooke and Robert Vergun for your volunteer fundraising with 350PDX that won us the tickets! For those of you who didn’t get tickets to this special showing with Director Avi Lewis and Naomi Klein, make sure to get to the second showing at the same location on October 20. You can buy tickets here. Our Children’s Trust is a dedicated legal team devoted to protecting our Planet, our children and communities, and our future generations through applying legal principals so that governments and other entities will act regarding Climate Change as they should. Remember Brown v. Board of Education, the Supreme Court Ruling that pointed out what now should seem obvious—that segregated schools are not equal? Well, if we have a right to education, surely we have a right to a Planet in good shape. The rights to life, liberty, property (and to the pursuit of happiness) depend upon a safe and functioning global ecosystem. The first major hearing for this case is on March 9, 2016 in Eugene–come join us or watch it live at the courthouse in Portland by special arrangement! Please ask your local and internet media to carry more stories about these lawsuits and about the urgency of addressing Climate Change. Plant-for-the-Planet and Climate Change for Families! Plant-for-the-Planet was founded in 2007 by nine year old Felix Finkbeiner and has already empowered more than 34,000 children worldwide in 193 countries to stop Climate Change with science, leadership, and planting trees. They have planted 14 billion; their goal is 1,000 billion by 2020. We all need to help! Climate Change for Families was founded in 2013 to bring the work of Plant-for-the-Planet to the U.S., beginning in Washington State. It is now working with Climate Change Recovery in Oregon and with other organizations to give children in more states and countries the opportunity to protect and change our future. 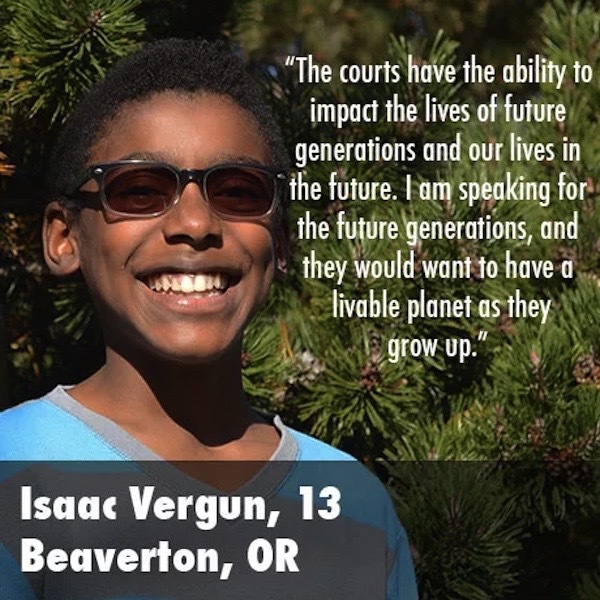 Climate Change for Families has already led several Academies inspiring children to serve the Pacific Northwest as Ambassadors for Climate Justice. For more information focused on the Northwest, especially Washington State, visit: ClimateChangeforFamilies.com. After the Academy, we work together in Plant-for-the-Planet clubs and as members of Earth Guardians Crews. Hundreds of children and their communities in the Northwest have been inspired to act, planting thousands of trees at home and abroad. Just as important, Climate Change for Families and Plant-for-the-Planet have trained these children and youth to advocate for our future with everyone from their friends to elected officials. In 66 countries, children have become Climate Justice Ambassadors at free one-day Academies. In addition to this site, learn more about Plant-for-the-Planet at https://www.plant-for-the-planet.org/en/home. 3) Reduce carbon use and plant trees to decrease CO2 and other greenhouse gases emissions. We are in the final stage of setting the date for a couple more Academies–so check back soon–or better yet, like and follow this blog! In early September 2015, Climate Change for Families was chosen as the newest Tzedakah Partner by P’nai Or of Portland! (Tzedakah means Justice.) Thank you, P’nai Or, for your support! Please contact us to find out how to help host a future Plant-for-the-Planet Academy: vergun @ alumni.stanford.edu ! There is no cost to hosts except for help with getting food for the students and covering some moderate photocopying costs. Your help with feeding our hardworking students for the day will be much appreciated; local business will help with this through donating food. Report on past Academies will be published here soon. More information about Plant-for-the-Planet and Climate Change for Families, which was founded by Michael Foster and started Plant-for-the-Planet in the U.S., can be found here: http://climatechangeforfamilies.com. Sierra Club is the only longstanding “Big Green” group that has taken on the Climate Crisis in a serious way, and they are doing an outstanding job! You are doing awesome work! I am so grateful for all of your collective talents and commitment. You are an inspiration.